The AR-15 has to be the most customizable firearm of all time. Not only can you customize the typical furniture or internals, but you can completely change how the rifle functions. What if you could change the complete structure of the firearm though? For example what if you could fold an AR-15? Fold it like a towel? Or a T-shirt? Okay – maybe not like a shirt, but you can fold the AR-15 in a variety of ways even though the system isn’t exactly known to be a folding gun. We’ll cover how systems manage to do this, some popular options, and if a folding AR is right for you. 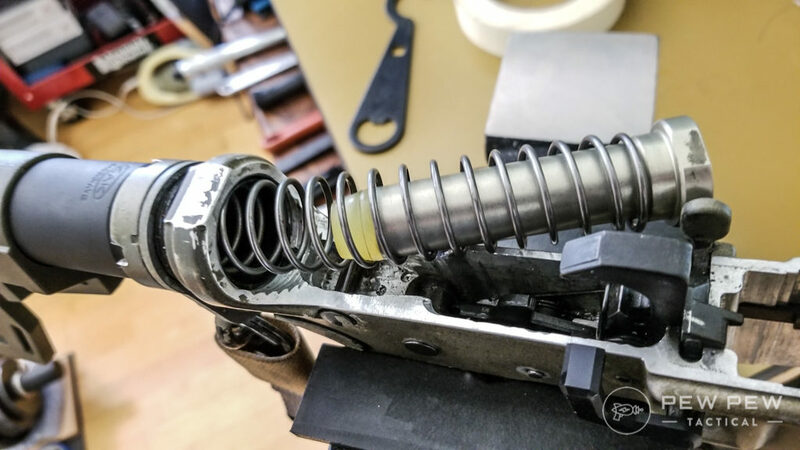 Lots of guns have folding stocks, but the AR-15 can’t exactly do that since the design’s incorporation of a buffer tube and a direct impingement gas system requires a buffer extension inside the stock. The buffer tube and buffer are simply in the way. We’ll get back to folding stocks on ARs a bit later, but let’s look at the other side of the weapon. We can ignore the stock, and focus on folding the AR-15 at the area where the barrel meets the receiver. Yep, what if we could fold the AR nearly completely in half in a very unusual way. When I first saw a folding AR, I thought that’s cool, but it is probably “Vaporware”. Vaporware is a common technique used by less-than-reputable companies around SHOT Show. The idea is to release some exciting products that seem to defy expectations without the intention ever to produce them. These products are designed to draw in people to their booths and generate interests in all their products. Since a folding AR sounded too good to be true, this is where I thought the folding ARs lived and didn’t pay them enough attention. However, then I saw two folding ARs, and then I saw that they were shipping. This leads us to, ***Record Scratch*** where I find myself today. While there are several small brands doing the folding-AR thing, there is only one big name manufacturers out there right now that are producing genuinely folding AR-15s. The aptly named FoldAR rifle company. Let’s talk about both and see what they offer the end user. Before we do that though why exactly would you ever want a folding AR? Of course, we want to go smaller! For some reason, the current gun industry is all about getting smaller, and the means to make a weapon smaller are changing. The AR is tricky to make smaller, but it’s very possible. The smaller a gun is, the easier it is to travel with, the less room it takes up in storage. Overall a folded AR is a very small and convenient weapon that can easily be carried as a trunk or truck gun within the right context. States like California have all sorts of rules about collapsing and folding stocks, but I have never seen one state ban the idea of a folding barrel. These designs open up the ability to make a rifle small in less free states. Smaller is often better these days, and these two companies have put the small in small arms. I appreciate a good pun and the FoldAR namesake is golden. It tells you everything you need to know about their ARs in a straightforward name. The FoldAR system is quite a bit more expansive than the XAR line. The FoldAR line includes rifles and AR pistols, as well as separate uppers and a variety of calibers. Rifle options include 16 and 14.5-inch barrels and calibers include 223 Wylde, 300 Blackout, 224 Valkyrie, 6.5 Grendel, and 6.8 SPC. The Pistol variants are limited to 9-inch barrels and come in 223 Wylde, 300 Blackout, and 6.8 SPC. The barrel folds to the left-hand side and creates 16 and 9 inch long platforms. You can also purchase independent uppers that can attach to MIL-Spec lower receivers. The FoldAR system holds repeated zero after folding and unfolding countless times, and FoldAR has used independent 3rd party testing to confirm this. You will need a small device to unlock the cam lever to fold the rifle, and this can be something as simple as a shell casing. The FoldAR system is identical to the XAR, and there is a reason for this. FoldAR designed the technology and licensed it to F&D. FoldAR claims they have upgraded the platform and made it more robust and easier to use. We got to try it at TriggrCon, very awesome! The best part of the FoldAR line is the Double FoldAR. This design incorporates both the Side folding barrel as well as the Dead Foot Arms side folding stock system. The Double FoldAR produces the smallest possible AR in the world and is my personal favorite of all of these systems. FoldAR is even promising a AR 10 variant of the system in 308 and 6.5 Creedmoor. Imagine having a backpacked sized full powered rifle. Pushing the boundaries of the AR concept forward into a smaller and more concealable package. Best of all complete rifles can be had for around 1,500 bucks, with pistols being a little more affordable. The Double FoldAR is a bit more, but that’s to be expected with the fantastic Dead Foot Arms side folding stock. Complete uppers can be had for only 850 dollars. These systems use most standard AR components, and there is very little proprietary about the system, which I like. Proprietary anything is always tricky. 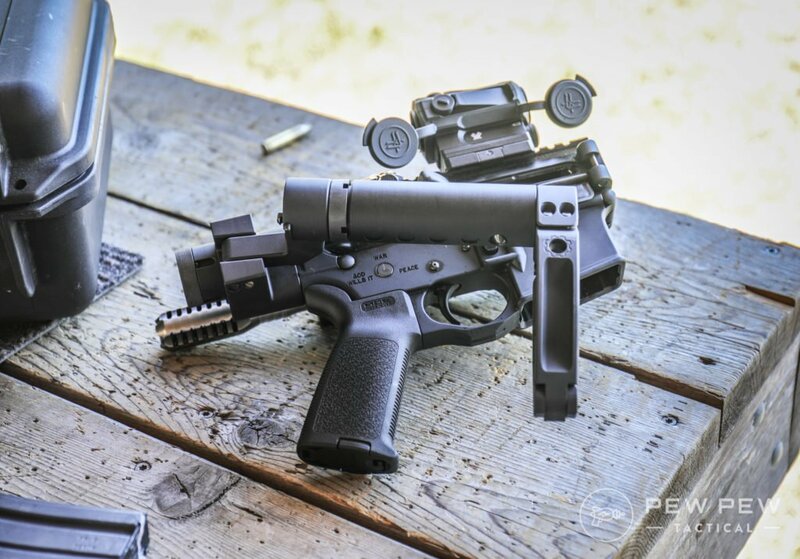 The FoldAR pistols are by far some of the most compact rifle caliber pistols in the world. It’s small, hard-hitting, and be stored in a messenger bag. The Double FoldAR is another impressive piece of gear I aim to add to my collection soon. If the above options aren’t for you-you can fold your AR in different ways. In my opinion, the above options aren’t the most expensive, but they are still pricey in the grand scheme of things. Alternative approaches to fold the AR involve the stock. We can’t not mention the LAW adapter. The LAW adapter was the first step in folding AR-15s. It introduced a way to fold the stock of a AR-15 while maintaining buffer integrity. The LAW is currently in its Gen 3 configuration and has only gotten better. The LAW can be installed at home in just a few minutes, and the instructions make it very clear how it works. One downside is that this system does not allow an AR to be fired with the stock folded so recognize that. It’s an adapter so you can use with any stock, or pistol brace and tube on the market. The LAW adapter is the cheapest option out there to have a folding AR and does allow you to use all your favorite furniture on your build. The LAW is a robust option that’s meant to be stable and reliable enough for duty firearms. Companies like Daniel Defense have started including the LAW on a few models of their rifles and for a good reason. It’s a no-nonsense, no compromise design. Its tough enough for a AR 10 as well, and LAW states explicitly this. The design does work with MIL-Spec lowers and receiver extensions so if you have something a little crazier than standard approach with caution. Easy to use and install, the folding stock adapter requires very little modification or special parts. What’s your take on the LAW adapter? Dead Foot Arms Folding stocks are a bit different than the LAW adapter. Admittedly they are a bit more expensive, but they also have the ability to fire when folded. These stocks won’t make the gun as small as a LAW adapter, but it does offer a true side folding stock. 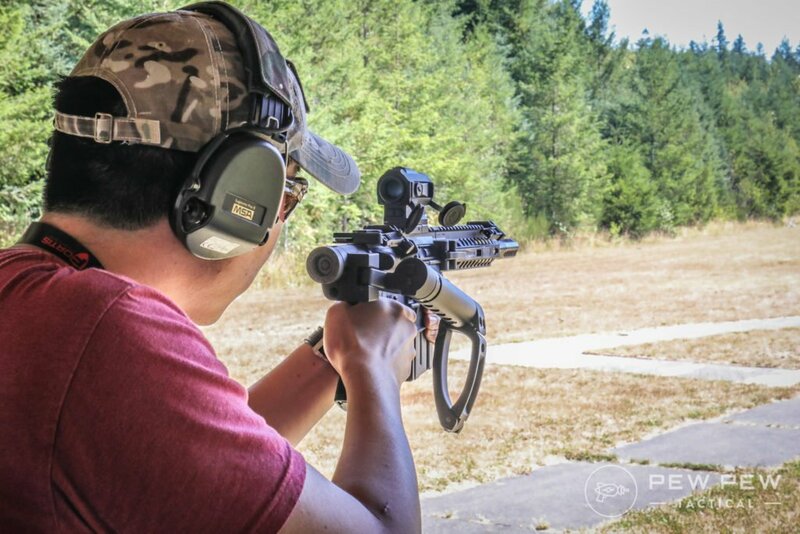 Stocks come in right and left-handed folding configurations and the stocks or braces are angled downwards and that allows the gun to eject appropriately when firing. 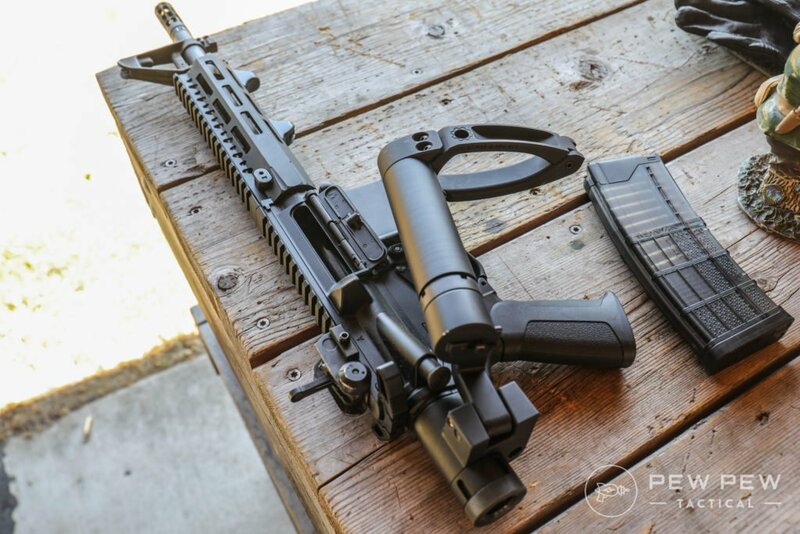 The Dead Foot Arms systems come in both pistol and rifle configurations with braces and stocks. There is also 9mm options, as well as your standard rifle options. The system uses a trimmer BCG and isn’t the cheapest option. However, it is more affordable than a side folding upper. The complete system is the only one out there that offers side folding capability with the ability to fire the AR. Folding ARs are a fascinating development that shows you how far the AR-15 has come. 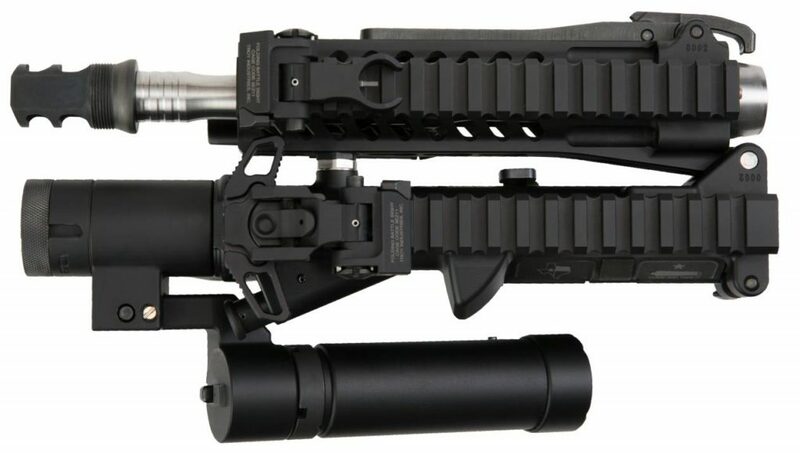 The Dead Foot Arms systems will work with 223/5.56, 300 Blackout, 9mm, 7.62×39, 6.5 Grendel, and 6.8 SPC. You are covered any way you want to come at it. 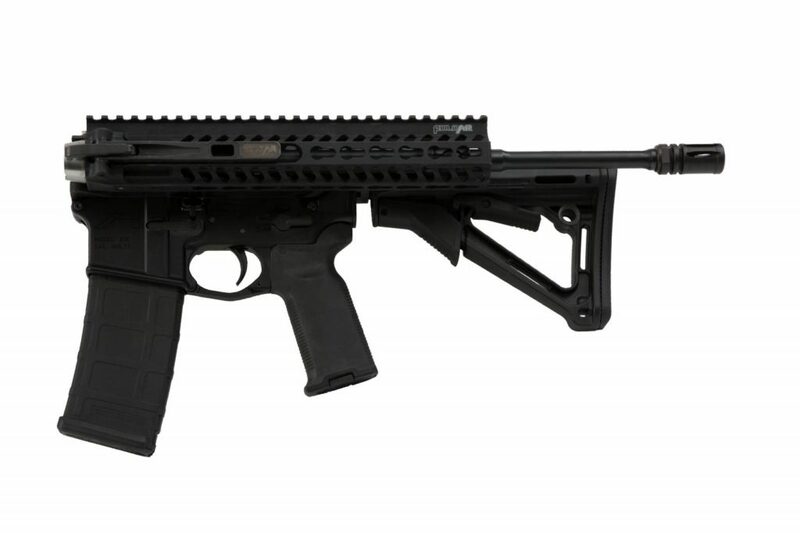 The AR-15 is a continually improving platform. It keeps adapting, changing and molding itself into a rifle that will seemingly last forever. The ability to fold an AR-15 has taken the AR-15 beyond a simple gun, and it can now do something very few weapons can claim. It’s also a bit new, which does create some caution but the folding AR phenomenon has been one of the most exciting mods I’ve ever seen in the AR-15 community. This caution is understandable, but each company listed has an excellent reputation for quality and innovation. If you’re looking for a more standard AR-15, our Complete AR-15 Buyer’s Guide is just what you need! Folding ARs are one of my favorite mods, what about you guys? Looking at other folding or compact guns…check out our Best Trunk Guns post. Now it’s not exactly an AR, but Kel Tec has been turning out the SU-16 in various models for years, and is actually a pretty terrific rifle. The “C” or Charlie model is able to fire with the stock folded over. Worth mentioning at least. Gotta check out the Robinson XCR. Not as foldable as the foldar but can fire with stock folded. You guys should do a review on one of them. Does the FoldAR fire when folded? The double FoldAR does with the DFA stock folded. With the barrel folded, if you take a hammer and a nail to the primer…it will.